This is the second model in Shadow’s coveted series of F1 cars. 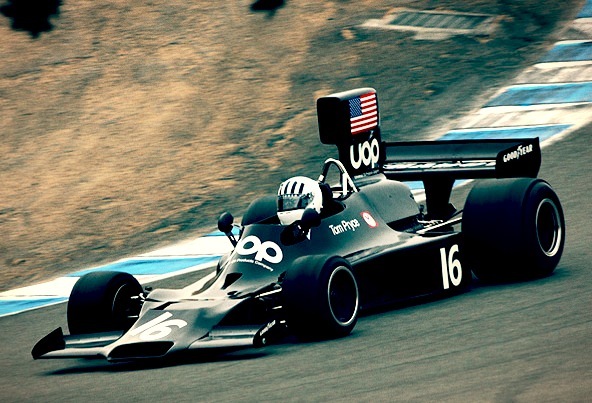 Driven by Tom Pryce in 1974, its best finish was 6th in the German Grand Prix at Nurburgring. For the start of the 1974 Formula One season, the previous year’s DN1 was driven by new Shadow driver Jean-Pierre Jarier for the first two races of the year and was retired from both. Jarier drove a DN3 for the remainder of the season. Peter Revson, a race winner for McLaren had also joined the team and had use of the DN3 from the start of the season. The DN3 showed immediate promise with Revson qualifying it fourth and sixth respectively for the first two races of the year. However, he was killed in testing prior to the South African Grand Prix and Shadow missed the race. Brian Redman took Revson’s place in the team from the Spanish Grand Prix for three races, with Swedish driver Bertil Roos taking over for his home grand prix. Tom Pryce, who had made his Formula One debut earlier in the year with Token Racing, then took over for the remainder of the season. Pryce finished 6th in the German Grand Prix to end the season with one point towards Shadow’s total of with seven points. The other six points came from Jarier, who, despite the death of Revson, continued as lead driver. In Monaco, Jarier finished third (having qualified sixth) and followed this up with fifth at the Swedish Grand Prix. The team finished in eighth place in the constructor’s championship.